Info "Gimme my key back!" Gravi-key is one of Dr. Crygor's microgames in WarioWare: Twisted! The name is a portmanteau of the words "gravity" and "key". 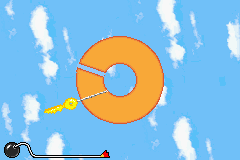 The purpose of the game is to turn the key ring around until the key falls out of the slot. 1st level difficulty: Get the key to drop down the slot. 2nd level difficulty: Get the key to drop down two slots. 3rd level difficulty: Same as two but is very difficult. This page was last edited on September 19, 2018, at 21:49.